As the days grow longer and warmer on the Vineyard, signs of the changing season can be seen everywhere — from the first beachgoers, to out-of-state license plates, to young men and women practicing on the Island’s athletic fields. 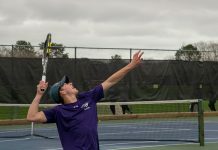 There are eight teams from the Martha’s Vineyard Regional High School that play spring sports, and all this week young athletes could be spotted preparing for the season — catching fly balls, running sprints, and perfecting their serves. As part of a two-week preview, in this week’s Times we take a look at baseball, softball, boys lacrosse, and girls lacrosse. Next week, the focus will be on the girls and boys tennis teams, track and field, and the sailing team. It was an interesting season last year for Coach Donald Herman’s softball team as they qualified for the state tournament for the first time in several years with a 10-10 record, but went winless (0-8) in the tough Eastern Athletic Conference (EAC). The coach said this will be a challenging season for his young team that has only one senior, Sarah Williston, along with six juniors and five sophomores. “We are not a very experienced team, but we have some good athletes with a potential,” he said. The team does return its top two pitchers, Hailee McCarthy and Emily Cimeno, who will also play in the field when they aren’t on the mound. Williston, meanwhile, is expected to play at catcher and outfielder. 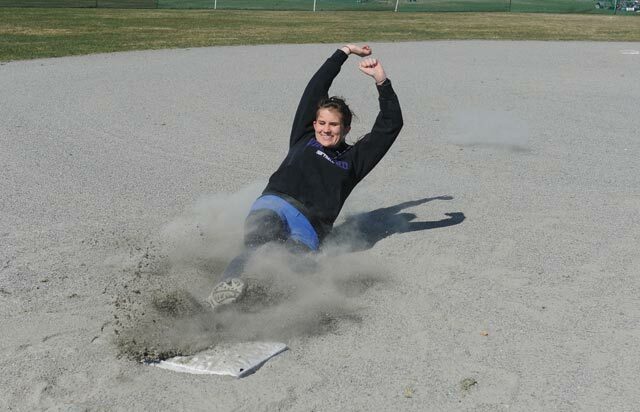 It’s been tough sledding for the softball team in the EAC in recent years: they have gone only 1-23 under Coach Herman in the conference, a testament to just how strong the EAC is. “It’s one of the top conferences around, every team in there is tough,” he said. Coach Herman projected that Kendall Robinson will likely be moved to first base, Megan Buchanan will play some infield, Miranda Tokarz will play infield and do some catching, and Shelby Lavin will play in both the infield and outfield. He said the team is working on fundamentals. “My goal is to make the routine plays. I would love to see them making diving plays, but if we can limit the opponent to three or four outs in an inning, as opposed to five or six, then we will be in good shape,” he said. The boys’ baseball team went 6-14 last year under Coach Gary Simmons and lost two seniors: Ben Ciciora and Corey Perrotta. This year the team has 10 seniors and six juniors on varsity and 16 players on the junior varsity team. Coach Simmons said he was optimistic about this season. “Right now we are just figuring out how everybody fits together, but a larger number of kids came out this year and we have some depth at pitching,” he said. William Stewart is expected to be the team’s number one starter; with Ryan Fisher and Alec Tattersall rounding out the rotation. Ramon Espino is projected at catcher, Stewart Hersh at first base, Chris Morris at second and Jack Roberts is expected to play shortstop. Mike Montanile is expected to play third, Ryan Fisher is expected to play centerfield, Noah Stobie is expected to play left field, and William Stewart is expected to play right field. The coach said he is still juggling his batting order. “We have some speed between Ryan Fisher and Jack Roberts, and we have some kids who can hit for power in Mike [Montanile] and Will Stewart and Espino. I think we have some flexibility, which is always good,” the coach said. 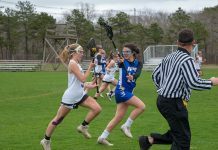 The girls lacrosse team should have another strong season under Coach Betsy Dripps. A total of 44 girls came out to play this year, including 13 varsity players who return from an 11-7 season last year that ended with a loss in the second round of the state tournament to Hopkinton. The team lost center Molly Fischer to graduation, but will be led by captains Madison Hughes and Shelby Ferry. Hughes had 95 points last season (53 goals and 43 assists), and will lead the offense, along with junior Alayna Hutchison who had 92 points (42 goals and 50 assists). Junior Taylor Poggi had 42 points (21 goals and 21 assists) and also returns, as will sophomore Isabel Smith who had 24 points (19 goals and 5 assists) and junior Jennie Lindland who was out with a leg injury last year. Senior Ambika Datta and junior Jenny Hart will round out the offense. Captain Shelby Ferry will anchor the defense along with returning defensemen Hannah Moore, Texe Craig and Paige Nitardy. Senior April Hargy will return as goalie. 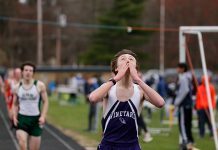 The Vineyard was co-champions in the EAC last year, sharing honors with Bishop Stang, but this year’s team intends to win the title outright, coach Dripps said. “I think we have that right mix of experience and youth, I like our chances,” she said. The team has a tough non-league schedule, playing Wayland, Scituate, Oliver Ames, Falmouth, and Natick. They will also host 36 players from England over Easter weekend, when they will play both a varsity and a JV game against St. Helen’s/ St. Katherine’s under the lights on Saturday, April 7. The boys lacrosse team finished with a disappointing 8-9 record last year, largely due to a spate of injuries that sidelined many key players most of the season. The Vineyarders are healthier this season and return with a nice balance of seniors, juniors, and sophomores. Coach Chris Greene said his team has chemistry and intensity this year. “We have a tough group of kids, and I think we can battle with anyone,” he said. Nelson Dickson returns as goaltender along with a strong set of midfielders led by Colby Gouldrup and Charlie Everett. Gouldrup missed most of last season, and will return to handle most of the face-offs. “Getting that draw is so important, and we missed that last year,” the coach said. Conor Smith and Will Jurczyk will anchor the defense, and Nick Costello will be one of the lead attackmen on offense. “I have a feeling we will be a midfield-based offense with Colby and Charlie – that has been our strength,” the coach said.